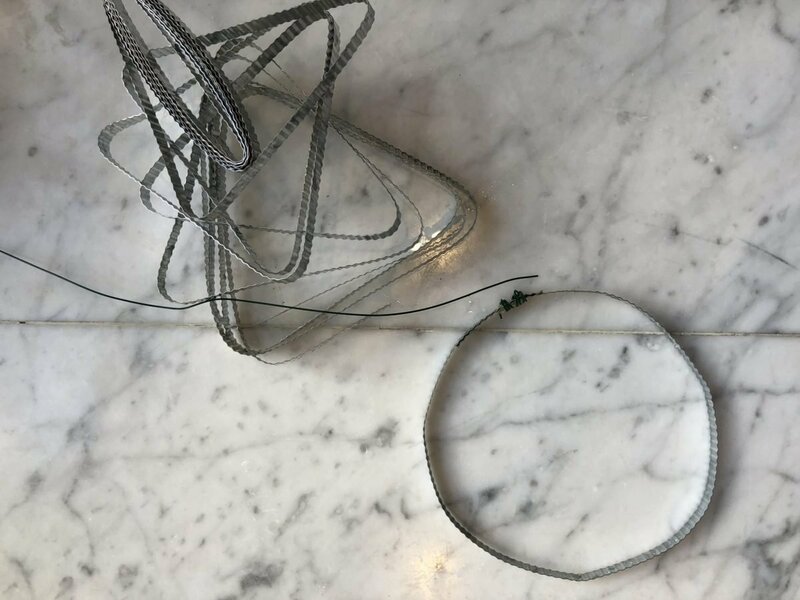 Don’t laugh, but I actually started out this blog post saying “Now that I am an experienced blogger …”. But, of course, I deleted it. Because it’s a total joke. I haven’t even been blogging for a year. What I had intended to say, was that one thing I have learned this past year as a blogger is that you need to decorate your home every season. It’s also a really fun thing to do. Because decorating for the seasons doesn’t involve remodeling. It is usually a day of styling. It might involve adding a color, a theme or a new piece of furniture to your home. 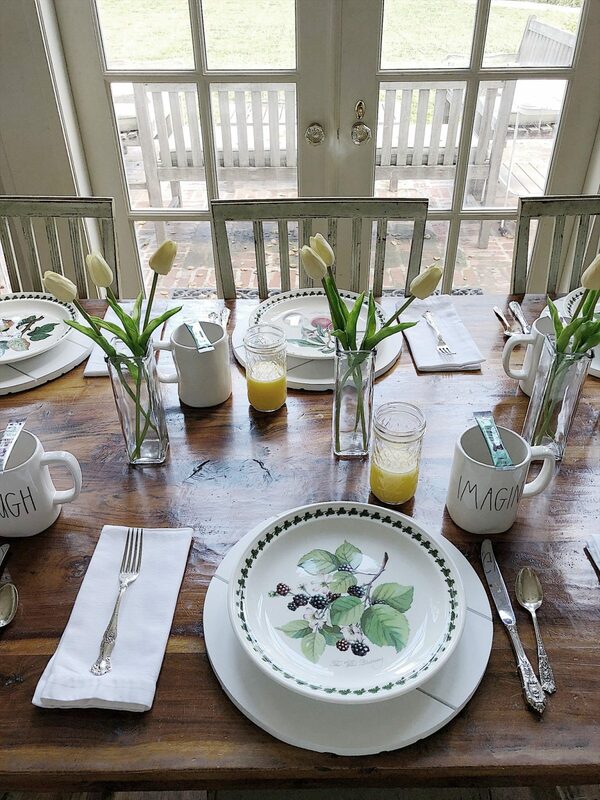 In today’s case, the first spring room I styled was for breakfast. I know, it sounds odd. But, trust me, it really was fun! I did come up with a theme for my spring decorating. It is the color sage green. It’s green that represents greenery and plants. We didn’t even know which room to start with, and somehow we ended up in the family room. 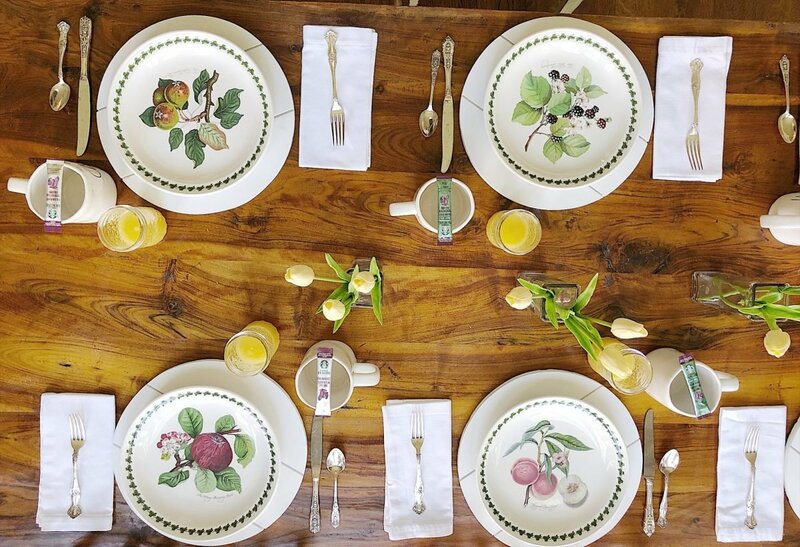 (We have a large farmhouse table in our family room and people often get it confused with our dining room.) And after about thirty minutes of trying things, my girlfriend came up with breakfast! The first item we started with are these awesome shiplap chargers I just received from Jackie at Saw Dust Angel. 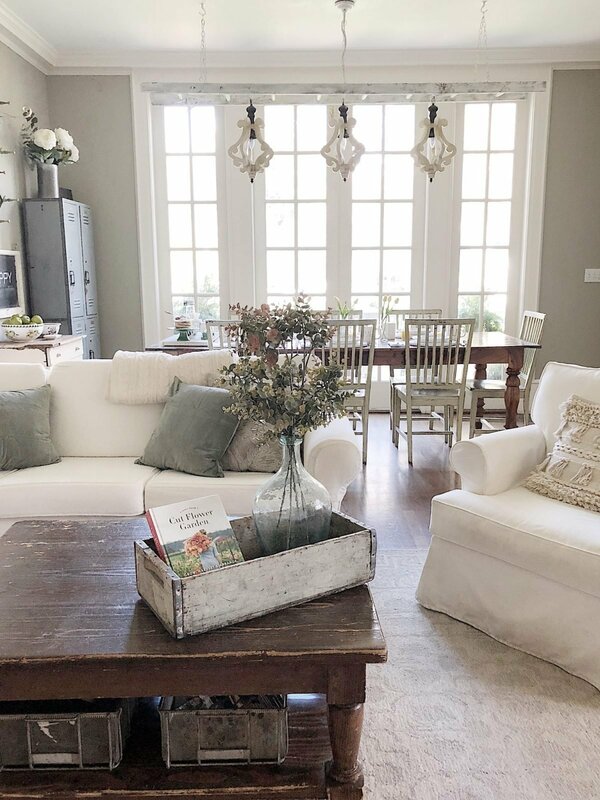 I love everything shiplap. But these charges? They are my absolute favorite. I am still grinning thinking about them. 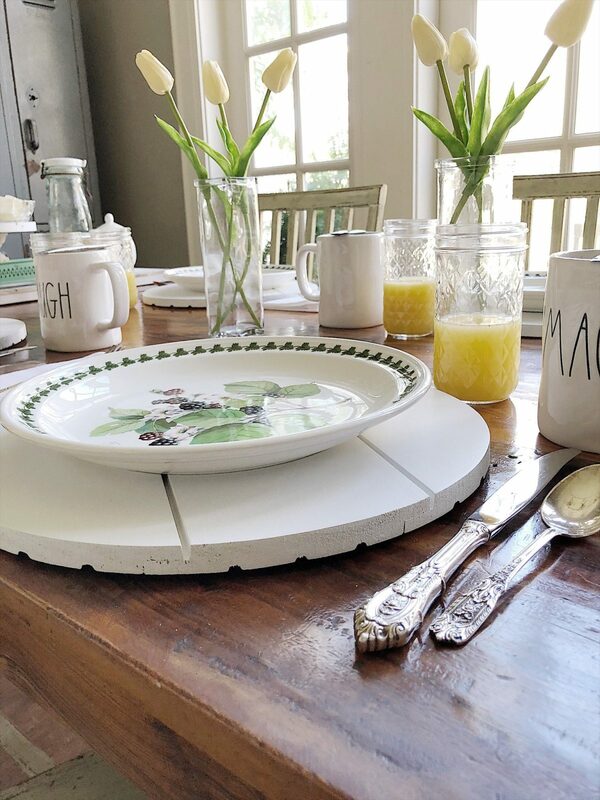 Is anything more perfect for farmhouse style decor? Then we pulled out my Portmeirion dishes, white cloth napkins and my silver (which is a combination of three sterling patterns and one silver plate pattern). Then we added some Rae Dunn mugs and my favorite drinking glasses, my jelly jars from Hobby Lobby. The real fun was the little buffet we set up at one end of the table. We decided this breakfast was the result of a “sleepover”. So we found the scrabble letters jar (which is on the table in our entryway … I use them to leave my husband and the kids messages) and came up with a lot of different scenarios as to how this “sleepover” came about. We laughed for quite some time and I think you might have some fun doing the same! The styling items for the buffet were all found in my Butler’s Pantry. 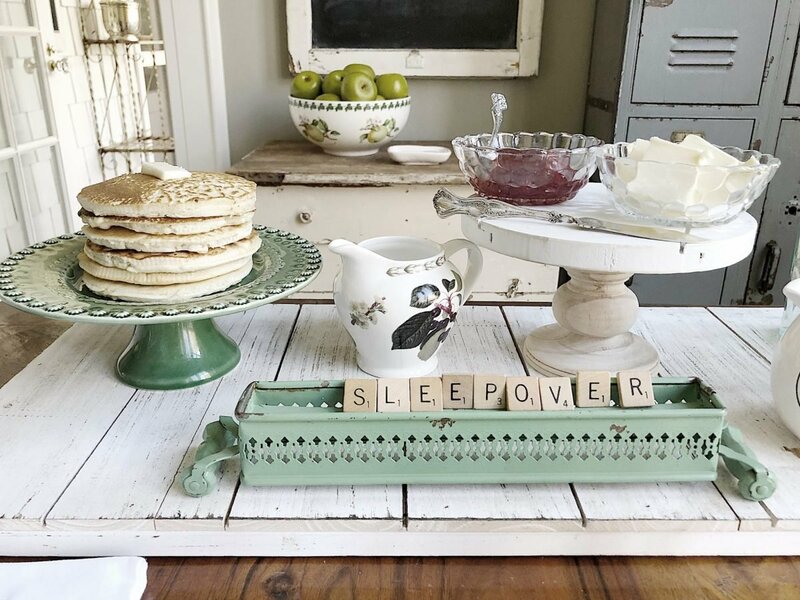 I used my vintage green cracker holder for the scrabble tiles. One thing I have very little experience in is food styling. I am learning how to add color and texture to my photos by using food (thanks to my friend Mary Liz), but it’s very hard. 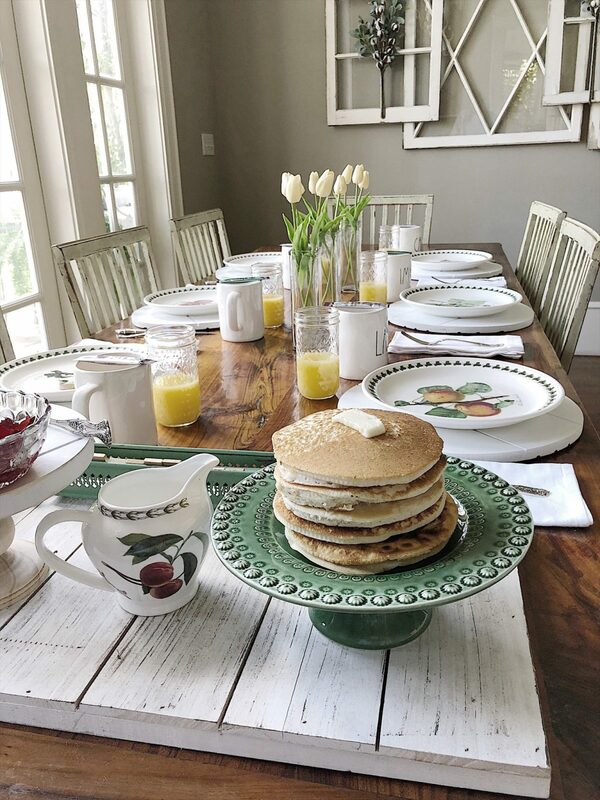 We both decided we needed a stack of pancakes to put on this adorable green cake stand. And I was obsessed with figuring out how to make them look like a perfect stack of pancakes. I finally decided to make a pancake mold. I know it’s kind of ridiculous, but it worked. Fortunately, I had some metal tape from Save On Crafts to make the mold. Unfortunately, we were out of Bisquick so I used flour and water for the batter. The mold worked and the pancakes turned out great. Sadly, I think they probably would have tasted like cooked wallpaper paste. We didn’t eat them. 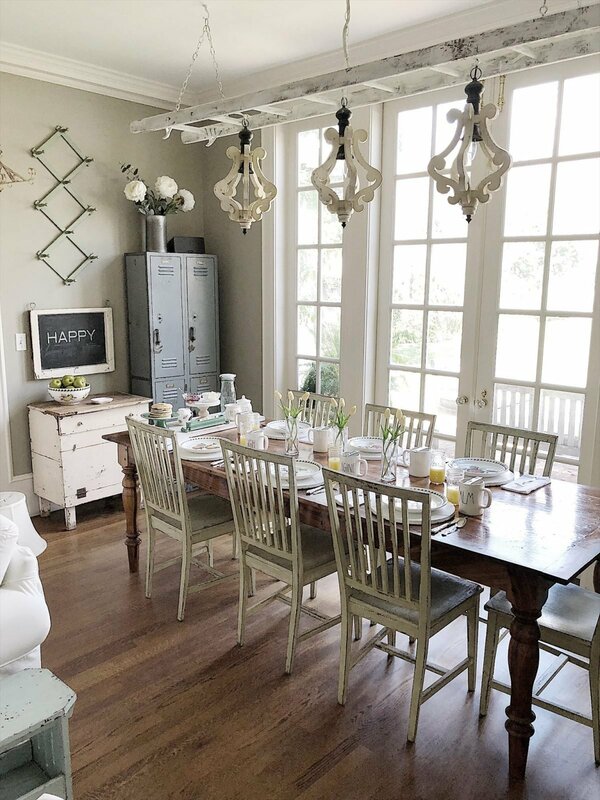 When we started our “spring styling project” we intended to decorate three rooms in three hours. Beleive it or not, our family and “breakfast room” styling project took all three of the allocated hours. So I still have to finish the dining room, craft room, and back porch. But that’s ok. Because this is so much fun. What do you think? Looks fabulous as always 🙂 your pancake story was cute. 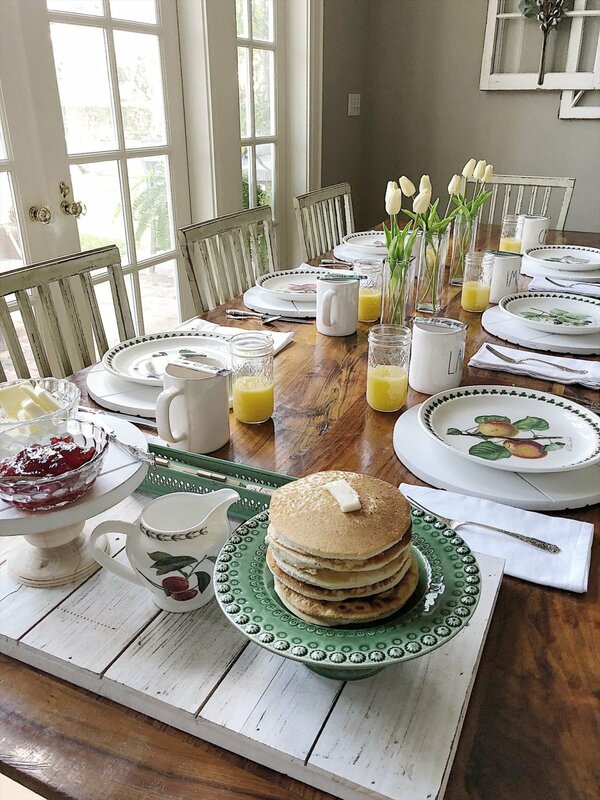 I was thinking,…She is on the ball here with a perfect looking pancake breakfast! This is REALLY pretty! ???????????????????? Your blog, as always, is fun to read. I appreciate your honesty because you seem to keep it real. I think that makes it attainable for everyone. You’re killin’ me with those chargers, lady!!!!????????‍♀️???????? We actually have a silicone mould for cooking eggs to make perfectly round English muffin egg sandwiches. I never thought about using it for pancakes ???? Your metal moulds are clever! Absolutely love this blog. I want those chargers but I don’t know where I can get them here in Australia. I will begin to search. Keep up the great styling blogs!